This textoffers innovative, multi-disciplinary perspectives on the subject of play in a range of environments: the classroom, playground, home, and local community. Chapters include observation notes, case studies and comprehensive illustrations of ideas in action, as well as encouragement for the reader to stop and reflect on their own practice with questions for consideration. 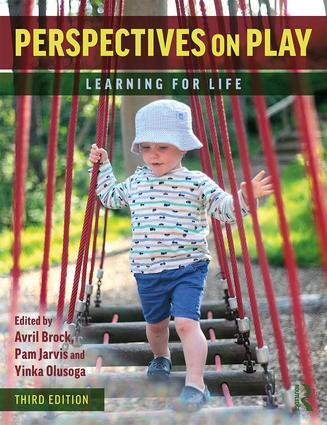 Perspectives on Play is an invaluable resource for any student studying within childhood studies, playwork programmes or training to teach at early years or primary level. It is also ideal for early years, primary and play practitioners. Chapter 3. Curriculum and Pedagogy of Play: A Multitude of Perspectives? Chapter 5. Playing in the Early Years: At Liberty to Play – Not Only Legal but also Statutory! Avril Brock was a principal lecturer in the Carnegie Faculty at Leeds Metropolitan University, UK, in the School of Education and Childhood, working with PhD, EdD, postgraduate and undergraduate students. She has worked in higher education since 1989, after being a deputy head, primary and early years teacher in West Yorkshire, often working with linguistically diverse children. Avril has recently retired and is busy playing with her grandchildren, as well as developing her play through golf, painting and photography! Pam Jarvis is Reader in Childhood, Youth and Education at the Institute of Childhood and Education, Leeds Trinity University, UK. She is a Chartered Psychologist and historian, who additionally has Qualified Teacher Status. Her research interests centre around developmentally informed policy and practice for children, young people and families, a topic upon which she regularly blogs in the TES and the Huffington Post. She teaches across various childhood, youth and family-related undergraduate and postgraduate programmes at Leeds Trinity University. Yinka Olusoga is Senior Lecturer in Early Childhood Education at the Carnegie School of Education, Leeds Beckett University, UK. Yinka’s research interests include: student teachers’ experiences of enhancing provision to support child-initiated play; the history of personal and social education; and the role of discourse in the social construction of childhood and of schooling.